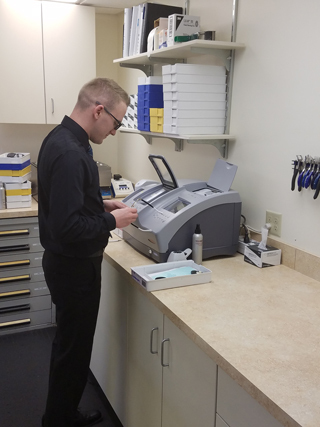 Lentz Eye Care is proud to operate a full service optical lab in the Rock Road office. The focus of our lab is to create top quality ophthalmic lenses for your glasses and get the finished product back to you in the quickest time possible. Our lab takes great pride in the quality of its workmanship. We start with purchasing the highest quality lenses from well known manufacturers and never purchase factory seconds or discontinued stock. The lab staff manufactures each pair of lenses individually to maximize the patient’s prescription. All of our doctors and opticians communicate directly with our lab staff in order to provide the highest level of precision and accuracy possible. Our fast ordering process combined with an expanded in-stock inventory allows for a quicker turnaround on your glasses order. In some cases we can complete your eyewear the same day or the day after ordering. 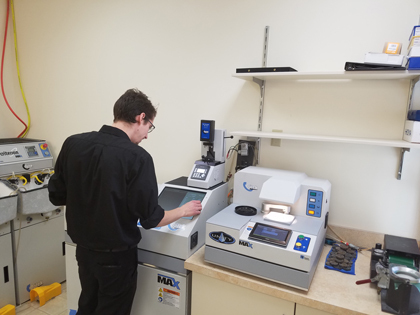 We also work with an excellent network of labs that provide us with top quality and fast service on anti-reflection coatings and digital freeform lenses that require more specialized equipment.